The Australian Nursing and Midwifery Federation is the union for registered nurses, enrolled nurses, midwives, and assistants in nursing doing nursing work in every state and territory throughout Australia. 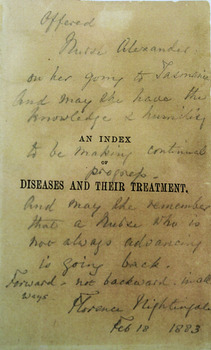 Hand written note by Florence Nightingale to Nurse Alexander, upon her departure from England to work as a nurse in Tasmania, written in pencil on the title page of a medical textbook. This item was found in an ANMF Federal Office archive box. It was taped into a picture frame, broken when found. The note was written on the title page of a book. The title page was separated from the book, and the book was not with the item. We believe the item came to the ANMF Federal office via the ANF Tasmanian Branch. A conference presentation was done in July 2017 about the subject of the note, Nurse Alexander. Original handwritten note by Florence Nightingale, addressed to Nurse Alexander upon her departure from England to work in Tasmania, Australia. "Offered Nurse Alexander on her going to Tasmania. And may she have the knowledge and humility to be making continued progress. And may she remember that a nurse who is not always advancing is going back. Forward not backward in all ways. Florence Nightingale. Feb 18 1883."